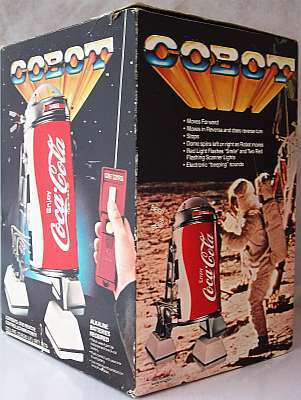 COBOT (the words “Coke” and “Robot” together) was a remote controlled toy robot designed by The COCA-COLA Company in the late 1970s. Cobot was a replica of the 4’ tall Cobot that Coca-Cola used in their promotional tool. The robot also resembled “R2-D2,” the popular robot from the trendy Star Wars film from 1977. 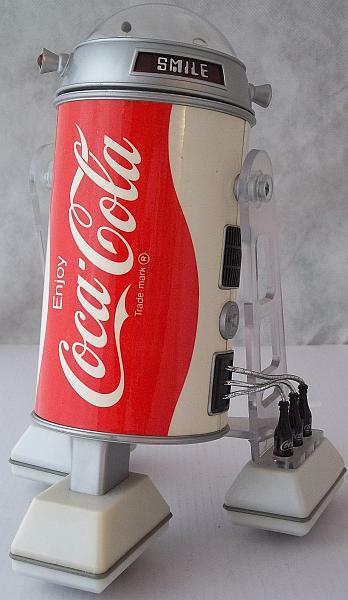 This similarity was what eventually caused Coca-Cola to stop manufacturing the Cobot, which has endured as one of the scarcer Coca-Cola collectibles. 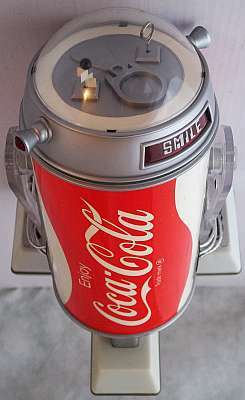 The Coca-Cola Company’s advertising theme during this period, “Have a Coke and a Smile,” is represented by the word “Smile” on Cobot’s head. Made of high-quality red plastic, Cobot’s nine inch tall body looks like a soda can, while his feet consist of three miniature “Coca-Cola” bottles. The red plastic hand-held remote control is 4.75 inch long (powered by a nine-volt battery, not included). Unfortunately, this particular COBOT is NOT functional, and has never worked, like so many that were produced. COBOT is still in the original box and has all the paperwork. The box is colorfully illustrated with Cobot standing on a barren planet. The other side of the box shows Cobot on the moon, engaging with an astronaut. The box measures 8.5 inches by 11 inches. It is in excellent condition, apart from some wear on the edges and corners. Both Cobot and the remote are in pristine condition and have never been used, other than to ascertain that they are NOT functional. 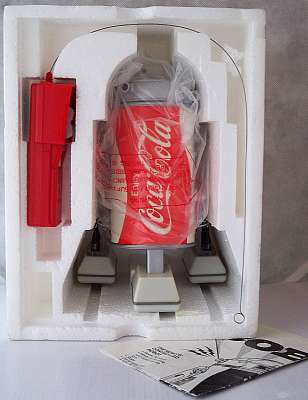 This unique and rare find is the perfect gift for someone who collects Coca-Cola, Star Wars, robots, or advertising promotions!